May 28, 1906 –Colonel S. R. Whitall, the commanding officer at Fort Sheridan, issues orders that prohibit soldiers from entering Highwood, the disobedience of which will lead to 14 days in solitary confinement on a diet of bread and water for any offender. Whitall’s order comes as part of a chorus of cries against the saloonkeepers in Highwood, a call for reform that has reached a peak after the suicide of a 17-year-old Lake Forest girl a day earlier after a night spent in Highwood. The Reverend E. R. Quayle, the head of the Law and Order League, says, “The midnight closing law is ignored on every hand, at least three of the resorts keep open on Sunday, and nearly all of them operate gambling tables in full view. Three of them operate ‘back rooms’ that are equivalent to wine rooms.” [Chicago Daily Tribune, May 29, 1906]Even the Chicago, North Shore and Milwaukee Railroad becomes involved, announcing that it will no longer sell liquor on its trains. Over the preceding weeks the scales slowly tipped against the saloonkeepers as convictions were secured with five establishments forced out of business. The suicide death on May 27 of Ms. Georginna Bower, the daughter of a Lake Forest house painter, increases the intensity of the crusade. 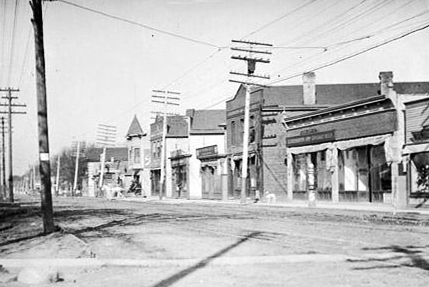 The above photo shows a strip of Highwood saloons a year earlier in 1905. May 28, 1894 – The Chicago Daily Tribune reports that Hugh M. G. Garden has been awarded the gold medal of the American Institute of Architects for the best architectural design, a plan that the architect worked up for the New York Herald. 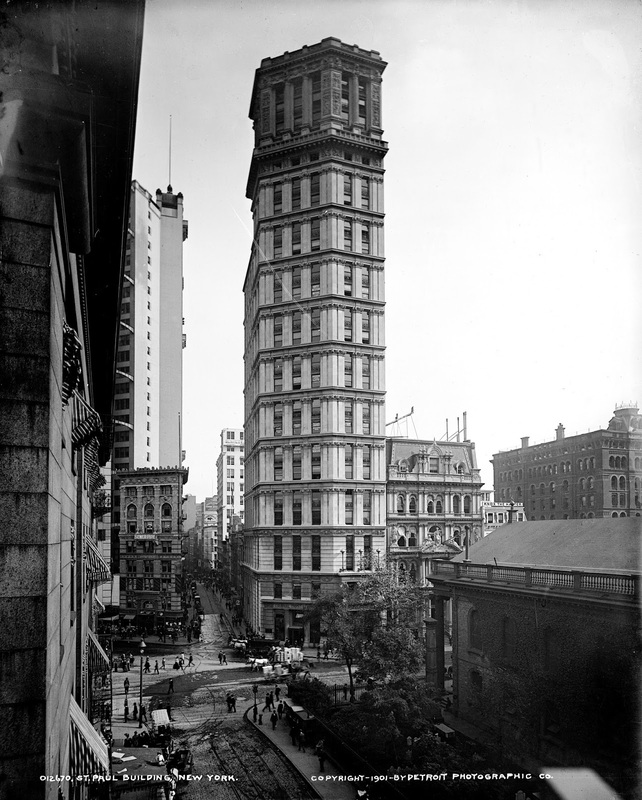 The Herald’s plan to replace its offices at Broadway and Ann Street resulted in a competition to which Garden contributed his design, “a nineteen-story office building, the planning of which was rendered extremely difficult on account of the extreme irregularity of the lot.” [Chicago Daily Tribune, May 28, 1894] The paper continues, “The design is radically different from the office buildings of the day and is remarkable for its picturesque sky line, the top being a delightful grouping of gables, balconies, towers and turrets … If built [it will be] the highest commercial structure in the world.” Garden, the president of the Chicago Architectural Sketch Club and one of the designers of the Montgomery Ward warehouse building at 600 West Chicago, was an active member of the Prairie Style designers who inhabited Steinway Hall not long after the conclusion of the 1893 World’s Columbian Exposition. His design for the New York Herald did not win the competition. The winning design by George B. Post is shown above along with the sketch of Garden’s vision. May 28, 1926 – It is announced that the Builder’s Mart, with a design by Graham, Anderson, Probst and White, will be erected at the southwest corner of Wacker Drive and La Salle Street. 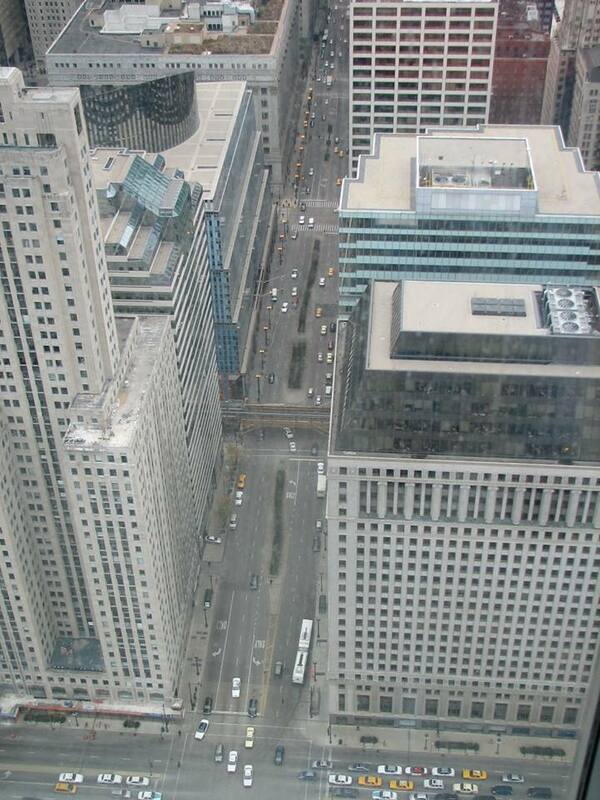 This will be the first improvement on the brand new Wacker Drive west of 35 East Wacker, completed in 1926. A. E. Coleman, President of the Building Construction Employers’ Association, says, “[This building] will tend to unite the business interests identified with the building industry. The popularity of such a proposition has been signified by building interests, as more than fifty per cent of the space already has been applied for.” In addition to Coleman’s association, it is anticipated that the structure will also hold the Chicago Master Steamfitters’ association, the Builders’ Association of Chicago, the Iron League of Chicago, the Illinois Highway Contractors’ association, and the Illinois branch of the Associated General Contractors of America. There will also be 10,000 square feet of space set aside for the Builders’ Club. 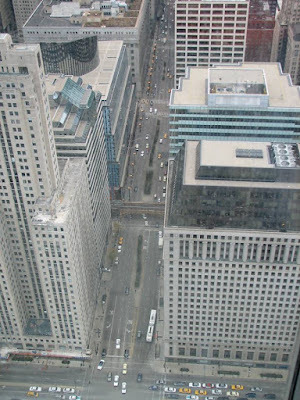 Off the lower level of Wacker Drive will be a garage with space for 150 vehicles. The 1927 building stands on the right side of La Salle Street in the photo above with a glassy addition designed by Skidmore, Owings & Merrill completed in 1986. Jim, I am with the Highwood Historical society. I was Looking for pics to promote an event we, along with the HIghland Park Historical Society and the Culinary Historians of Chicago, are having this Thursday in Highwood at Santi's Garden. I came across your posting of downtown Highwood in 1905. Thought I would pop of a note to you to see if it might be of interest to you or any of your followers. The title of the event is High and Dry on the North Shore. A presentation by Northwestern University Professor, Bill Savage. I understand it will be a rip roaring good time (as most things are in HIghwood.) It starts at 7 PM on Thursday, Sept. 20th. It is free and OH@ If you live in the City of Chicago (or anywhere else) hope on a train from Chicago and take it to Highwood. Santi's Garden is literally RIGHT across the street. Would love to see you there! Thanks. https://www.facebook.com/Highwood-Historical-Society-69905749345/ Just in case you want to check out our Facebook page. Thanks again for posting that great story. We are celebrating our 150 anniversary as a community this year....and planning on having a presentation that will tell this incredible story about Fort Sheridan and Highwood. Will let you know when it happens. Thanks again.